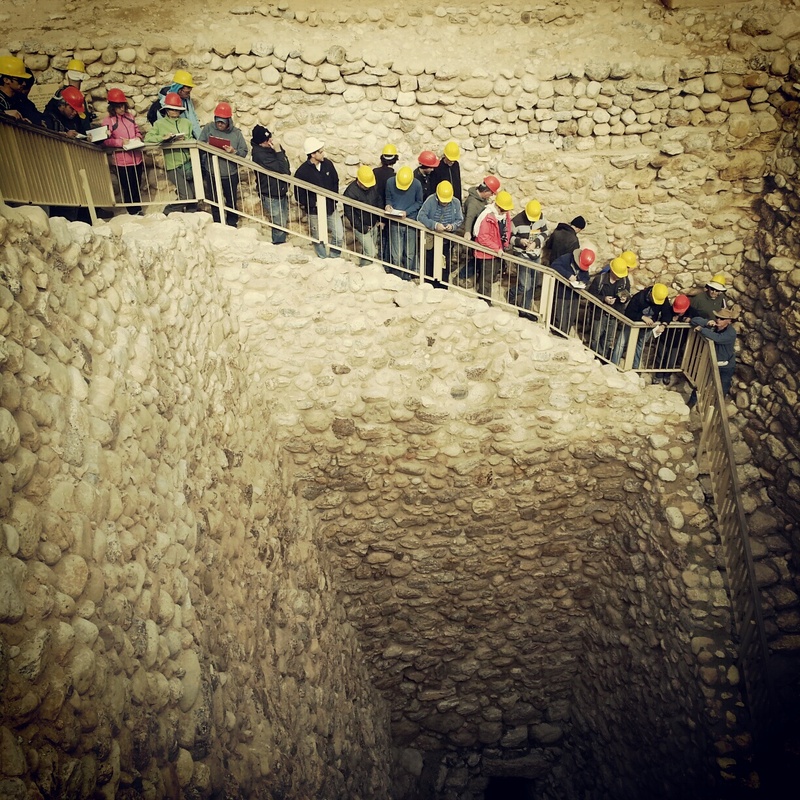 For today’s tour, we took a break in our current historical narrative (1948 and all that) to travel back 2000 years in history with a visit to the desert fortress and palace of Masada. 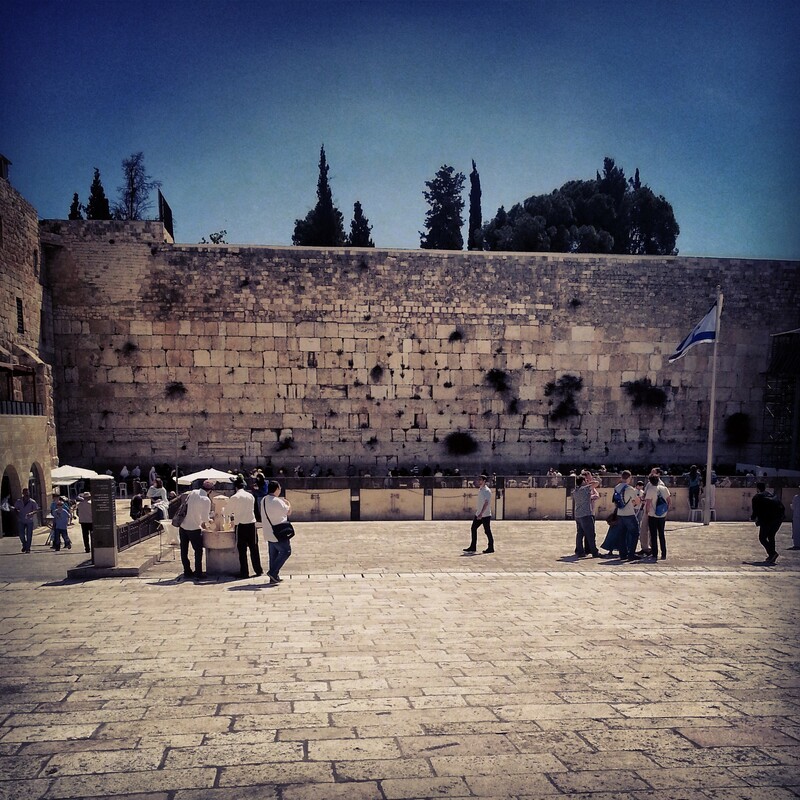 One of Israel’s most famous destinations, and a UNESCO World Heritage Site, this is certain to be a place we shall visit regularly in our future careers as tour guides. As part of the course, we sometimes have to practice guiding ourselves, and the majority of the site was divided up between members of the class. At this relatively advanced stage in the course, everyone did a good job of relating their specified information or story, and it made for a varied and interesting day. I worked out that this was my seventh visit to Masada, but coming with the course really opened my eyes to parts of the site that I had never noticed before! We began on the western side of the mountain, and before ascending the Roman ramp, headed left to explore the network of cisterns. 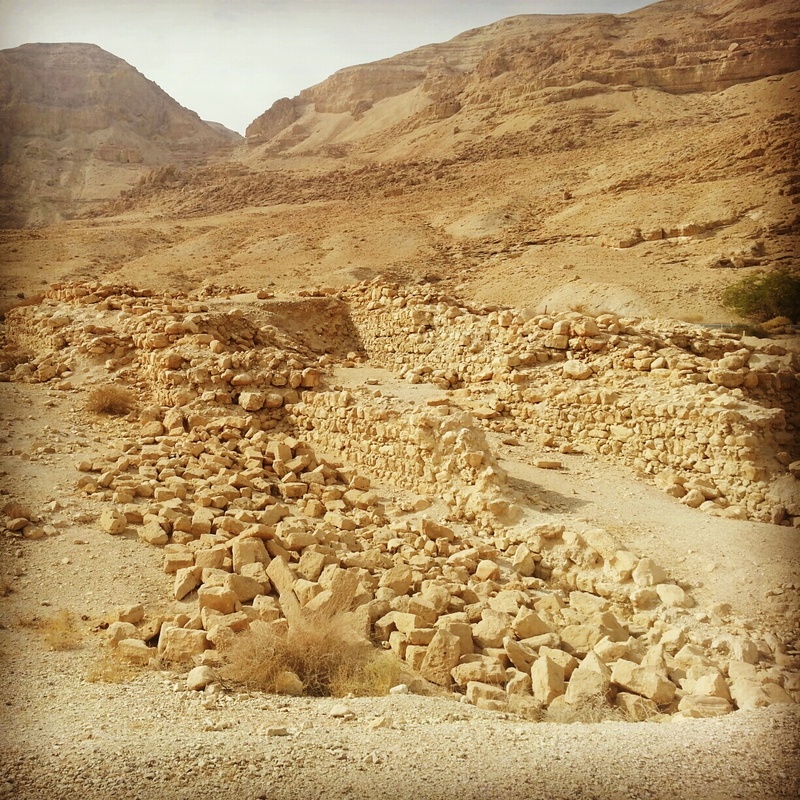 There are no natural water sources at Masada, but when Herod developed it into a major fortress, he constructed a huge network of channels and cisterns to capture the waters of the annual desert flash floods. This made the fortification even more secure – those above had up to two years’ water supply in storage; the nearest water supply for any besiegers (who anyway would have to deal with the strong desert sun and heat) was around 20km away. After climbing the ramp, we heard the story of the last stand of the Jews who had begun the revolt against Roman rule some seven years previous. Numbering only around 500, they had to face the might of the Roman army’s troops (estimates around 10 000) with significantly superior training, armour and weaponry. A dramatic tale indeed! We toured the mountain top, starting with the 5th century Byzantine church (which I must confess I never previously noticed! 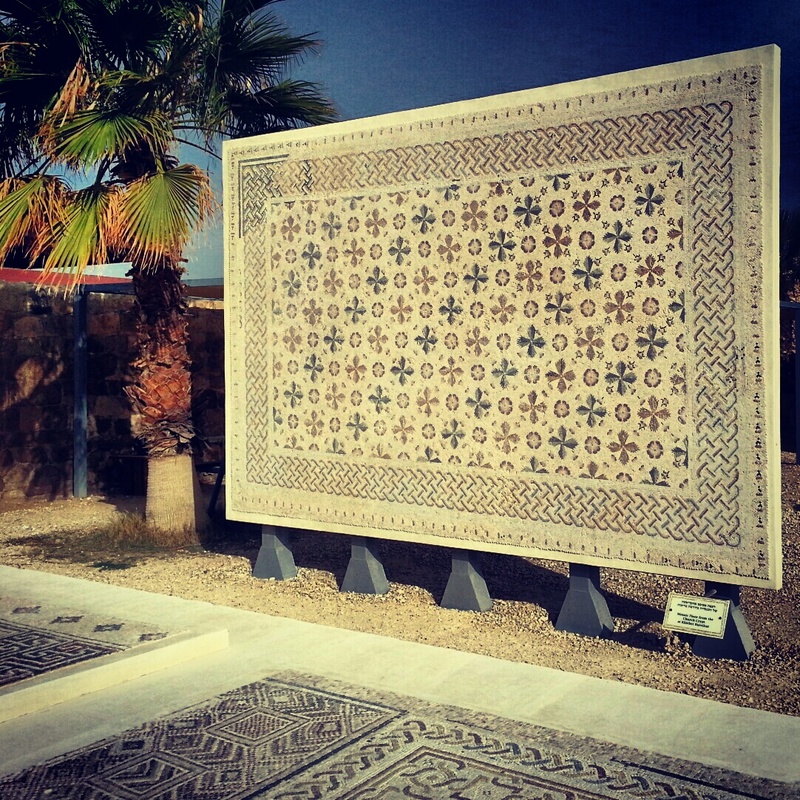 ), containing a beautiful mosaic, moving south through the grand western palace (containing some of the oldest mosaics in Israel) and to the southern wall fortifications. Along the way, we learned about life on Masada, both in the time of Herod and then later during the time of the revolt. 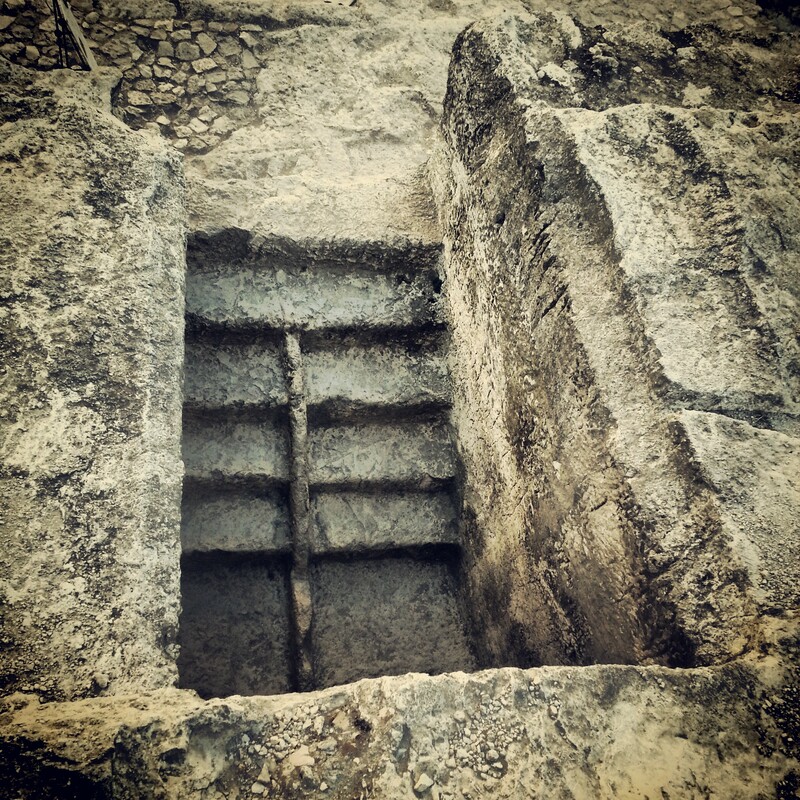 Many remains were found on the site testifying particularly to the final days of the families who lived up there; their narrative is important for Israelis as they were the last independent Jews until Israel was established in 1948. After taking in the outstanding view from the Northern Palace, and hearing about its history (and the amazing archaeological finds there), we visited one of the world’s oldest synagogues and learned the final fate of the Jewish rebels. For those who have yet to visit the site, I shall not give the game away! View north from Masada towards Ein Gedi and the Dead Sea. Note the remains of the Roman camp on the left. 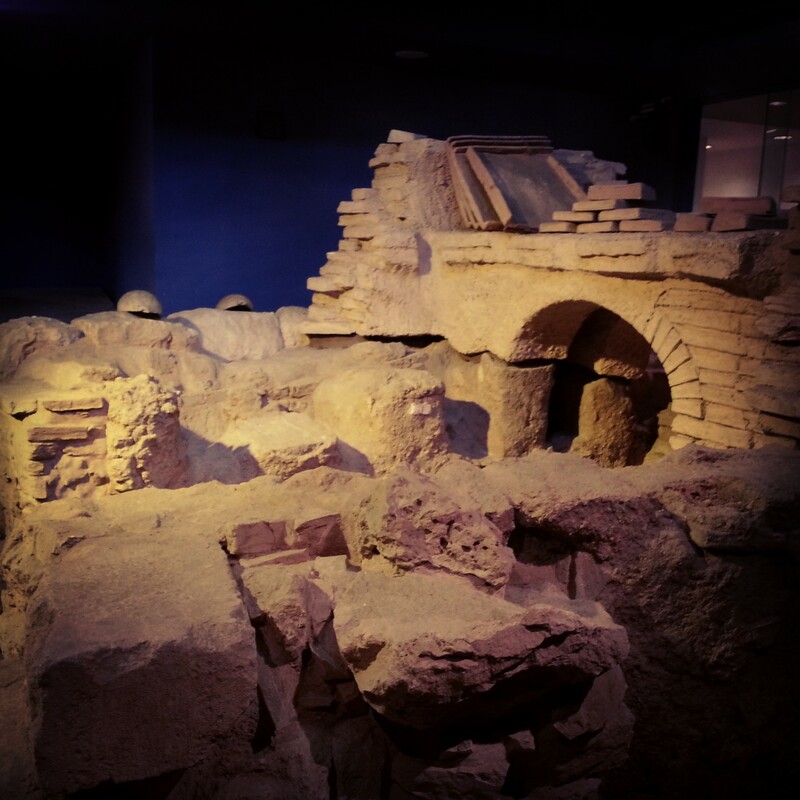 We concluded the visit with a stop in the Masada museum, which boasts fantastic displays of many of the artefacts found in the excavations, including everyday items of the Jewish rebels and the Roman soldiers. The dry desert air helped their preservation and it really is a remarkable collection. If anything, this tour proved that even if you have been somewhere six times previously, there is always something new to see and learn. 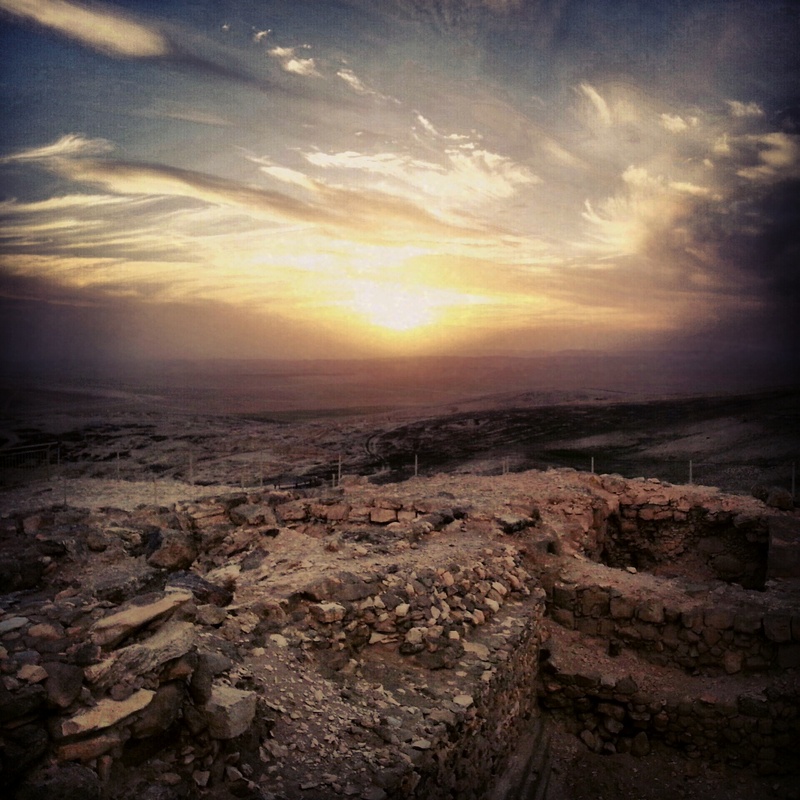 So, even if you have visited Masada many times before, perhaps the time has come for a repeat visit. After various introductory field trips we are now at a stage where our weekly excursions are broadly supposed to tie in with what we are studying class. 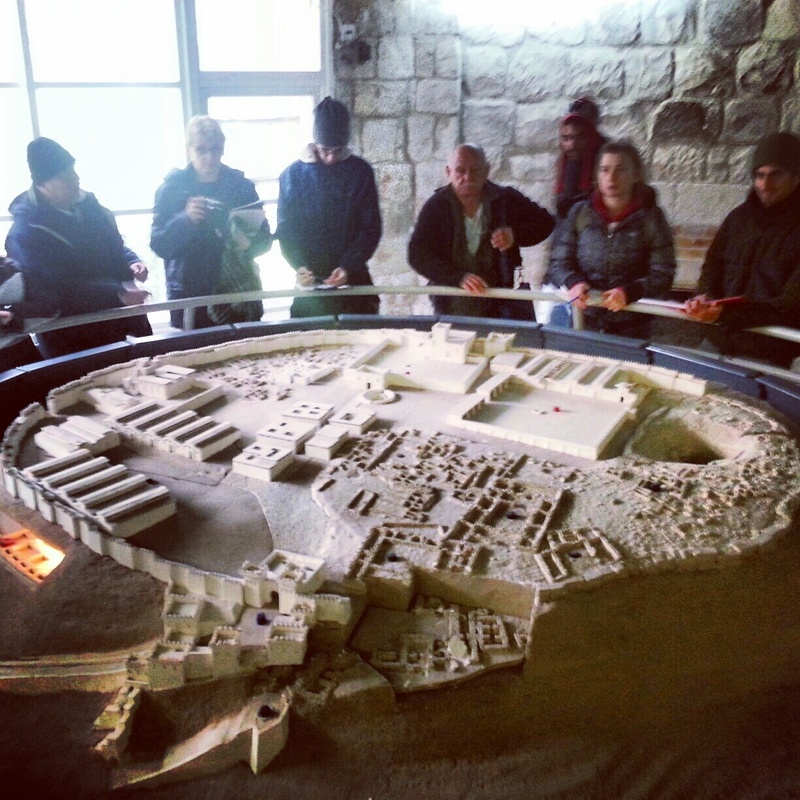 Therefore, as we began our lessons on archaeology we spent last week exploring some of the tels (archeological mounds) in the north, and this week we were doing the same but in the south, in the biblical Negev. However, our first stop was unconnected. En route on the border of the Judean lowlands and the Negev is the Joe Alon Centre for Regional Studies (focused on the Negev region). 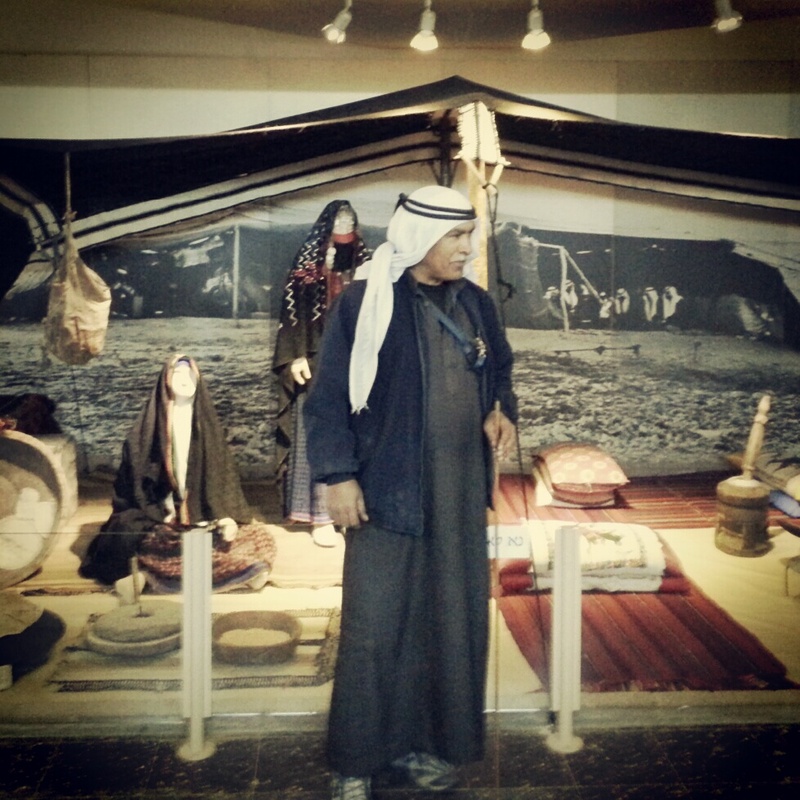 The main part of the centre (and, in my opinion, the most interesting) is the museum about Bedouin culture. The Bedouin are a nomadic people who in Israel are mostly located in the Galil and desert regions. They are moving away from their traditional life and now the majority live in fixed accommodation; however on travels through the desert it is still possible to see their tents. Although the displays are a little tired and don’t look like they have been touched since the museum opened in the 80s, there is still a lot of interesting information and we were accompanied by a Bedouin guide who went into more details. There was also a short film about the Bedouin in the Negev which was a very good and concise introduction to their lifestyle and the challenges they face in the modern world. After being led around the museum we were taken into a traditional tent structure where we were served sweet tea and learned about the important culture of hospitality. A most pleasant experience. 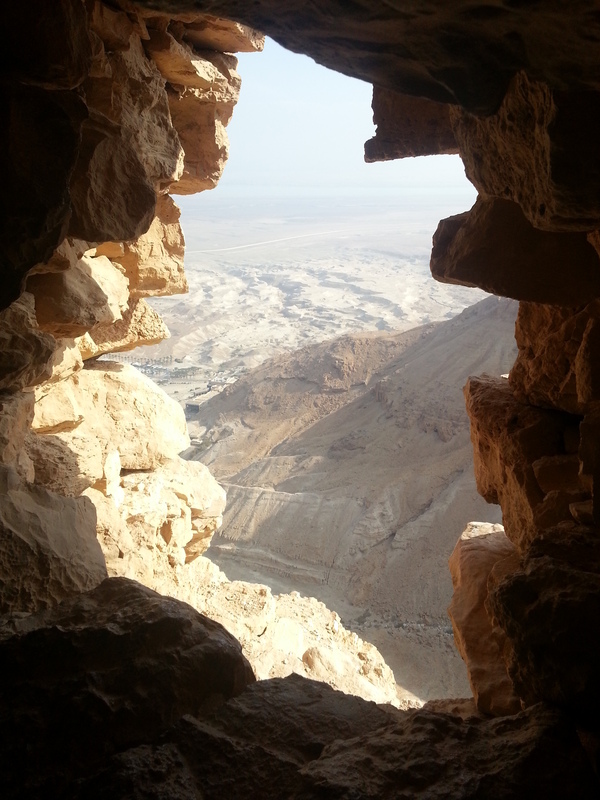 From there we quickly looked at the replicas of various cave dwellings in the Negev, from the late stone age to the Bar Kochba revolt, and enjoyed the view over the area from the elevated viewpoint. The tours and videos are available in English (although you probably need to call ahead) and it is a nice stop if one is heading southwards. We continued south to the region of the biblical Negev. Unlike the Negev of today, this was located only in the area of the valleys of Arad and Beer Sheva, and was a border region between the desert and the rest of the country. 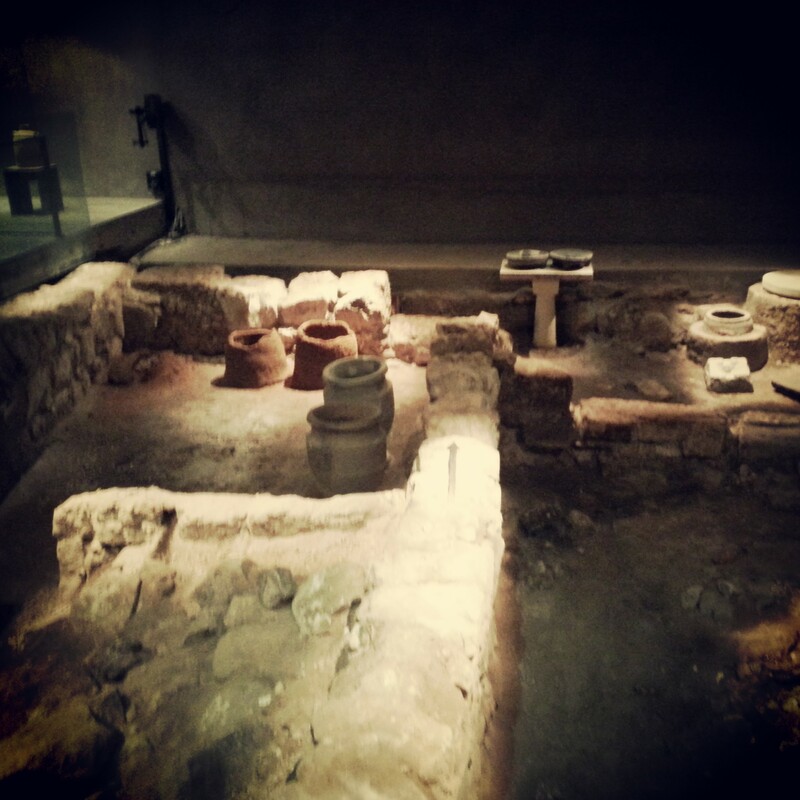 Our first destination here was the UNESCO world heritage site of Tel Beer Sheva. 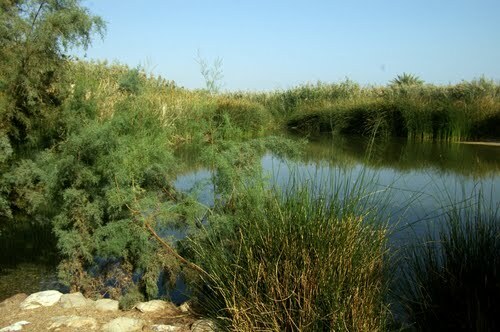 Located near modern Beer Sheva, it is considered by some to be the site of the biblical city where Abraham dug his well. 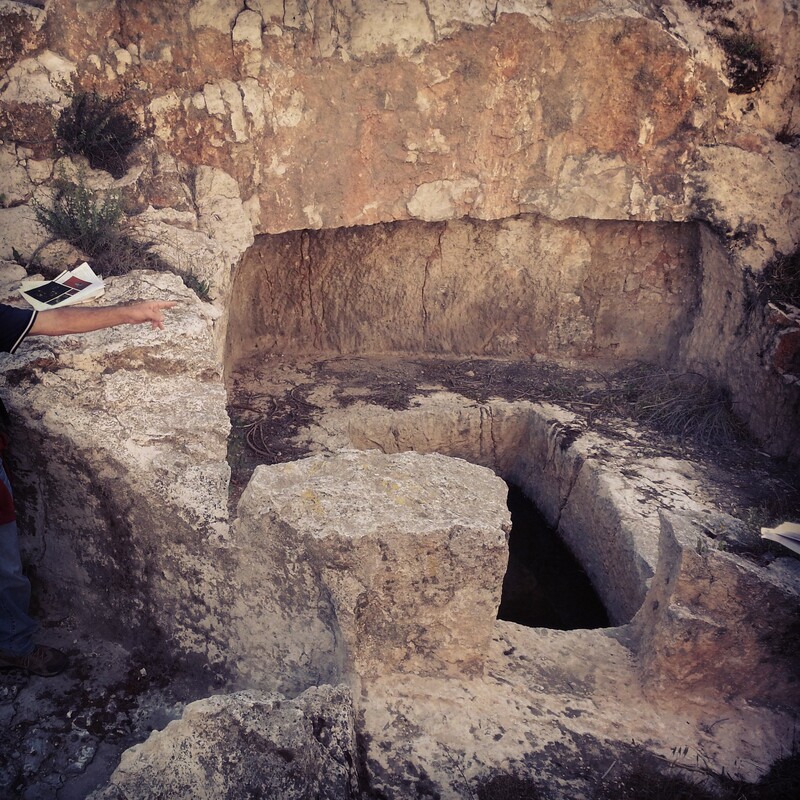 The remains on the mound are later, from the post-Exodus period of the Israelite kingdom. They are very impressive (hence the UNESCO recognition). Our guide took us around, explaining the function of different structures and our theories on their uses and purpose. Most incredible was the underground water system, constructed in case of a siege. Huge caverns had been hewn out of the rock and covered with plaster; water was then secretly diverted from the nearby Hebron stream (when it was flowing) into this underground reservoir. We walked out through this water system (for extra fun, we were required to wear hard hats!) 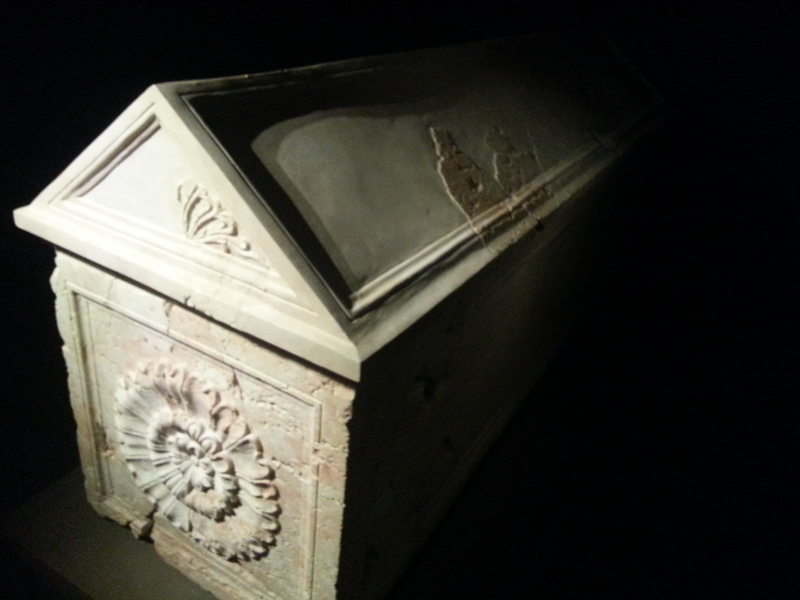 and saw the replica of the altar they found at the site; an impressive cube structure with horns on each corner; the original is now in the Israel museum. Our final destination was at Tel Arad, located just outside the city of the same name, where we were honoured to be guided by one of the site’s main excavators. This tel is important as it contains the remains of a vast city from the early Canaanite period, with no further layers above it. This means that archaeologists can use it to really understand what life was like in this period, without the confusion of having other later constructions intermixed. We learned about the typical building construction, now found in other places but still called the ‘Arad House’ as it was here that it was discovered for the first time, and in such large quantities. Our guide also explained to us his theory that the Israelites came into Israel about 1000 years earlier than the current received opinion. Sadly (for him) he seems to be rather alone in this point of view, although he argued his case well. Given that it would mean reorganising the entire chronology of the ancient world, I can see why there might be some resistance. 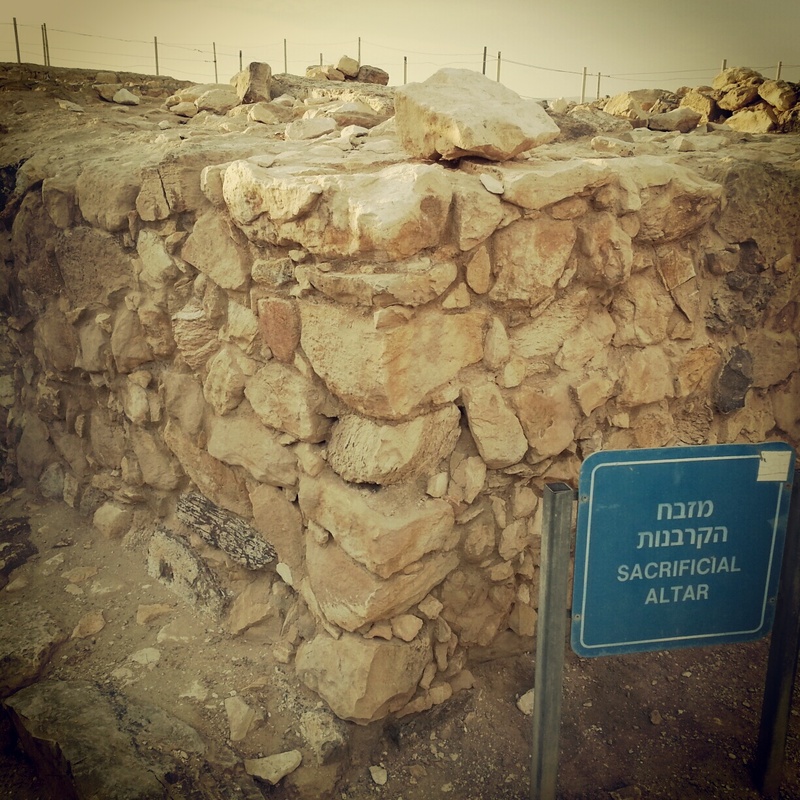 We then went up the hill to visit the Israelite period fortress. Although there was no inhabited settlement here since the early Canaanite period, there were fortresses along the border with the unruly desert nomads. 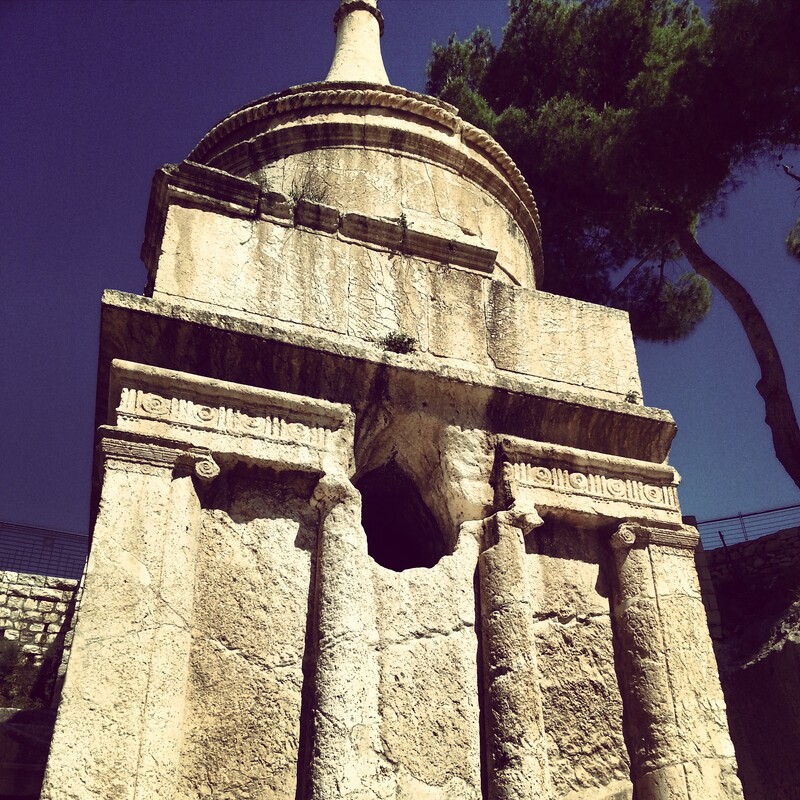 The fortress was a large impressive structure, and contains the remains of a temple; evidence that there were other temples outside of the main one in Jerusalem. It seems to have been destroyed at some point, perhaps as part of the concentration of ritual Judaism into the capital city. We enjoyed the stunning desert sunset over the ancient ruins and then began the long journey home. 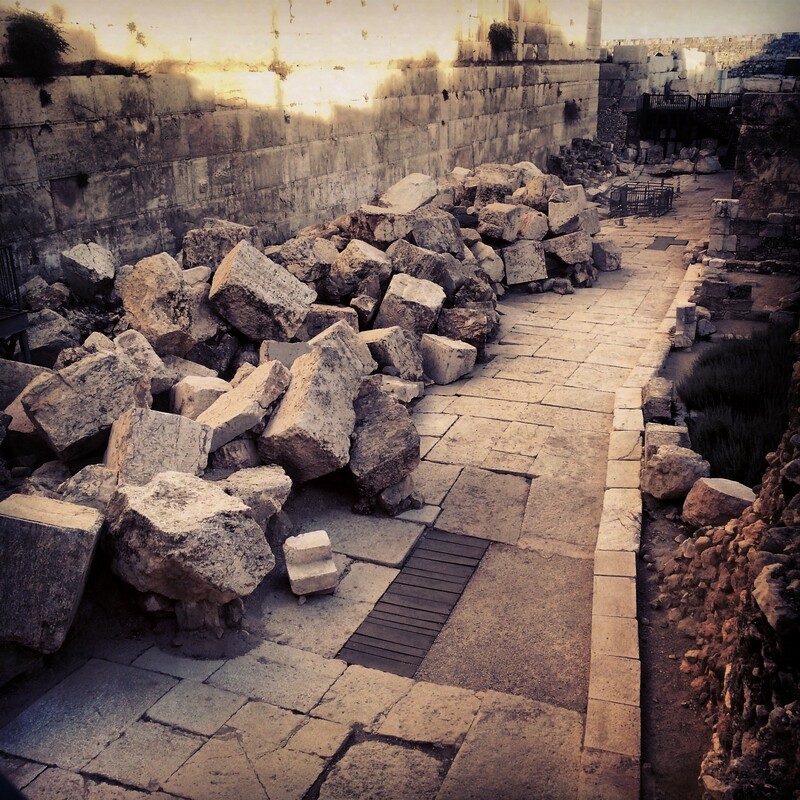 It is the day before our weekly field trip and Israel is in the midst of its worst storms for ten years. The main motorway in Tel Aviv is flooded and closed. The trains aren’t running. Snow is forecast in the Golan and in Jerusalem. Amongst these fierce winds and torrential rain, some of the course members contact our coordinator. Surely tomorrow’s field trip is cancelled? It seems that it is not. Disbelief. And the beginnings of a mutiny. But in our night class, our coordinator makes it clear: “the tour guide course goes out into the field, even through fire and through water” (I think it sounds better in Hebrew). He was almost seeming to relish it. The rebellion was quashed. So it was that we assembled, as usual, at 6.30am at Arlozorov bus station. Except this time we were all looking somewhat larger due to the multiple layers of clothing and waterproofs. Spirits were surprisingly high. We were in this together, “through fire and through water”. And off we set. Our trip was to be connected to the Via Maris, the ancient Sea Road connecting the two great regional empires of Egypt and Mesopotamia. In the end, only some of the sites were connected to this road, but the majority of the day dealt with those that were. Remarkably, as we headed north the skies began to clear. A miracle? Nonetheless, the ground was extremely muddy at our first stop at El Ahwat. An archeological site dating from the Bronze age, some believe that this is the home town of the biblical character Sisera who famously met his end when Yael bashed a tent peg into his head. There seems to be a connection in the architecture with the Nuragic culture of Sardinia, and a theory is that the people who lived here came across the sea bringing their culture with them. Unfortunately the site was rather inaccessible as it was effectively a very large bog. But we got a bit of an idea. Sadly the bus driver was not so appreciative of the mud adorning our boots. We carried on a short drive to the small town of Katzir where we enjoyed a viewpoint over to the Carmel. Our guide pointed out key sites including the route of the Via Maris and the topographical features of the area. With this overview we moved on to the site that was to form the largest part of the day’s itinerary, Tel Megiddo. A Tel is an archaeological mound. At some point in ancient history a group decided that point x was a good point to settle. Perhaps it was close to water, had good fields for agriculture, was easy to defend etc. Over the years the settlement might be destroyed, or deserted, and then later rebuilt, each time over the previous ruins, rising up and up to form a Tel. 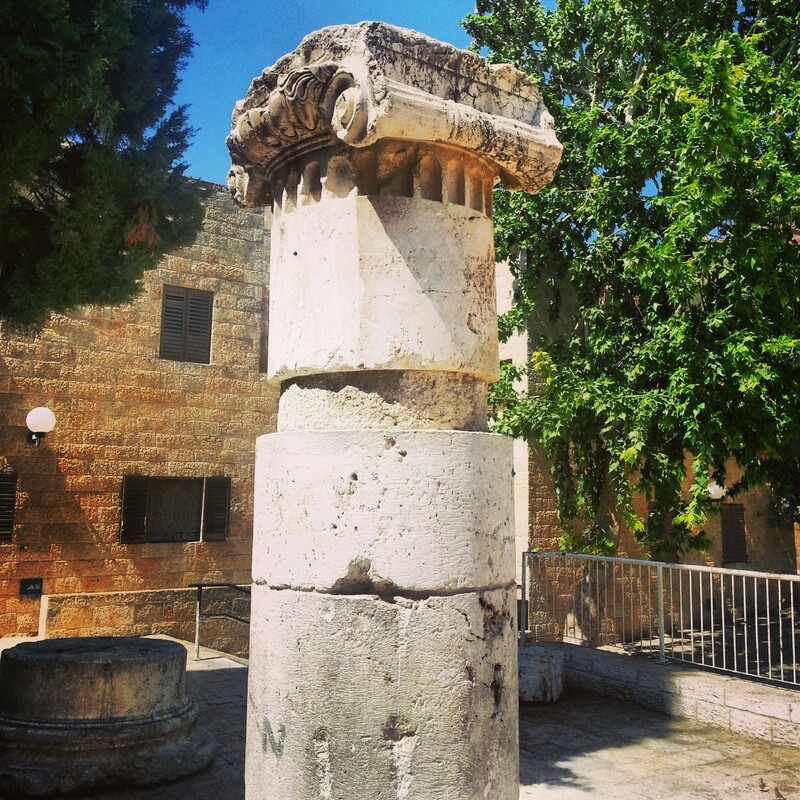 Israel is full of these Tels, each of which is an archaeological treasure trove of different periods of history. And one of the richest is Tel Meggido. The site was made a UNESCO world heritage site in 2005 and has been under excavation since the beginning of the 19th century. And they’re still finding more and more. It had a prime location at a key junction on the Via Maris, close to arable land and a constant water supply, leading to many battles for its control. Eventually the Israelites wrestled control of it from the resident Canaanites and most of what is visible in the excavations is a mixture of the Canaanite and Israelite periods. Most impressive are the series of Canaanite temples on the east side of the Tel (facing the sun). Sadly our excursion on the Tel was somewhat hampered by the darkening skies followed by hail. Yes, hail. Despite this, we gallantly continued around the site through bouts of being pelted by ice pellets. And our brave guide managed to impart to us a great deal of useful information. I think though, it will be worth a return visit in better weather. Also of note is that Tel Meggido has been identified with the end of days vision of John at Armageddon. Har is Hebrew for mountain/hill; Har + Megiddo and the connection makes sense. Furthermore, a few hundred metres away has been unearthed a mosaic floor containing an inscription with the earliest known reference to the Christian religion. Hence there were a few groups of Christian tourists also braving the weather with us, and they have my full respect for doing so! From Meggido we moved on to Tel Jezreel, another archaeological mound along the Via Maris. Our guide took us through the generations of occupancy of the mound from the Israelite period through to the Romans, Crusaders (the ruins of a church have been uncovered here) and the Arab village that was here for 100 years prior to 1948. 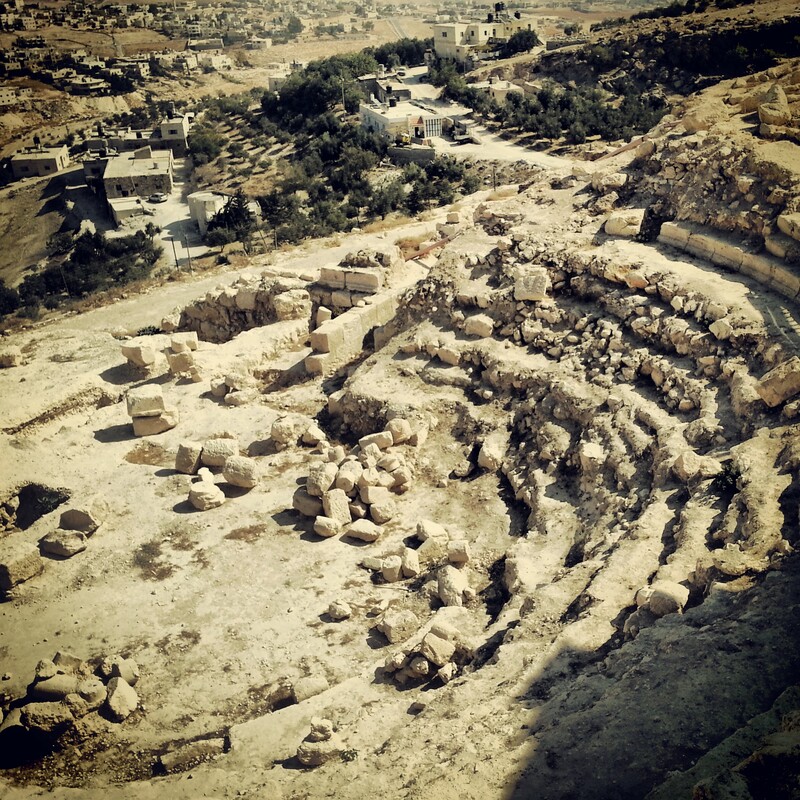 We learned about the battle that took place here between the Israelites and the Philistines as recounted in the Book of Samuel, and then the later battles that took place here in the Israeli War of Independence. On the way out of the Tel we passed the monument for the soldiers who died in the battles to control the mound in the modern era. It was time to leave the Via Maris and our next port of call was at the ancient synagogue at Beit Alfa (somewhat confusingly located not in Kibbutz Beit Alfa, but in Kibbutz Heftziba, next door). 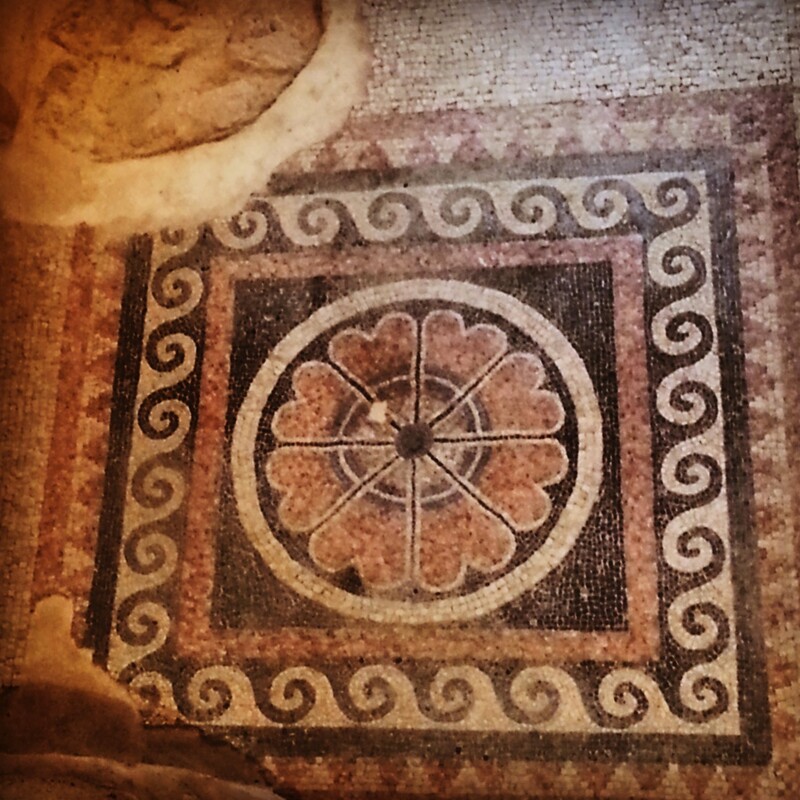 The ruins of this ancient synagogue from the time of the Second Temple have been loving restored including a stunningly impressive floor mosaic. Interestingly, the mosaic includes the signs of the zodiac and an image of a foreign god. I doubt they would be allowed in synagogues today but it seems that in these ancient times they were just perceived as decoration (and indeed something that the people who made the mosaics knew how to do). Inside the synagogue you can watch a rather cute film which acts out the hypothetical story of the mosaic’s creation. It is a cute and creative way to explain what is before you and makes the site much more engaging, certainly for children but for adults alike. We concluded the day by driving up to the Mt Gilboa ridge at the edge of the Samarian hills. As we went up the steep ascent we were treated to stunning views of the valleys below bathed in sun with the streams running full of water (many of the streams in Israel are dry most of the year) and the fields rich colours of green and brown. We arrived at our first lookout point at Mt Barkan, the highest point on the ridge, but sadly the explanation of what we were seeing was curtailed by another hailstorm, this time the hail was around half a centimetre in diameter and it really hurt! Our guide bravely struggled on but eventually had to concede that our exposed position on the mountain top was not perhaps so wise in the current conditions. Still, we briefly enjoyed the view. We carried on a little further along the Gilboa scenic road to Mt Shaul. The hail had turned to light rain so we alighted and enjoyed the stunning views while our guide read to us the sad story of the first Israelite king, Saul. He is said to have fallen on his sword at this point. It is also apparently a very good spot for paragliding. The clouds parted so we took advantage to walk a short trail around the peak before returning to the bus, homeward bound. The green and hilly region of the Galil in the North of Israel is divided into two, largely based on topography. The Lower Galil is lower in two senses of the word; it is both further to the South and has lower hills (affectionately referred to as mountains in Hebrew). The Galil is a beautiful place to visit. The rolling green hills make a beautiful backdrop; they are filled with hiking trails. It is also an area of great historical significance. 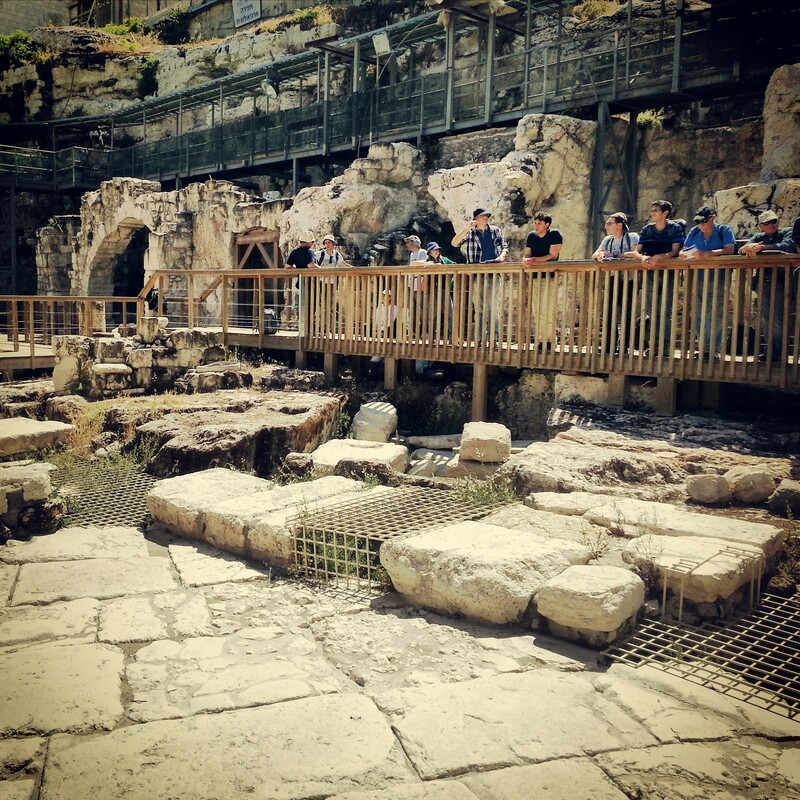 The Galil contains the city of Nazareth, the childhood home of Jesus, and a lot of the miracles he performed took place here. From a Jewish perspective, it became one of the main Jewish centres after the second temple was destroyed; there were several towns here which hosted the Sanhedrin, the Jewish parliament, and indeed the Mishna (Oral Law) was codified in one of these towns, Tzippori. But neither Tzippori nor Nazareth were the focus of today’s trip. Rather, we were to get an overview of the region. This overview began at Tel Chanaton. A tel is an archaeological mound. This means that it was a dwelling place for man over several centuries, and was destroyed and rebuilt several times. Each time it was rebuilt, the new settlement was constructed on top of the remains of the old one, and the mound grew. 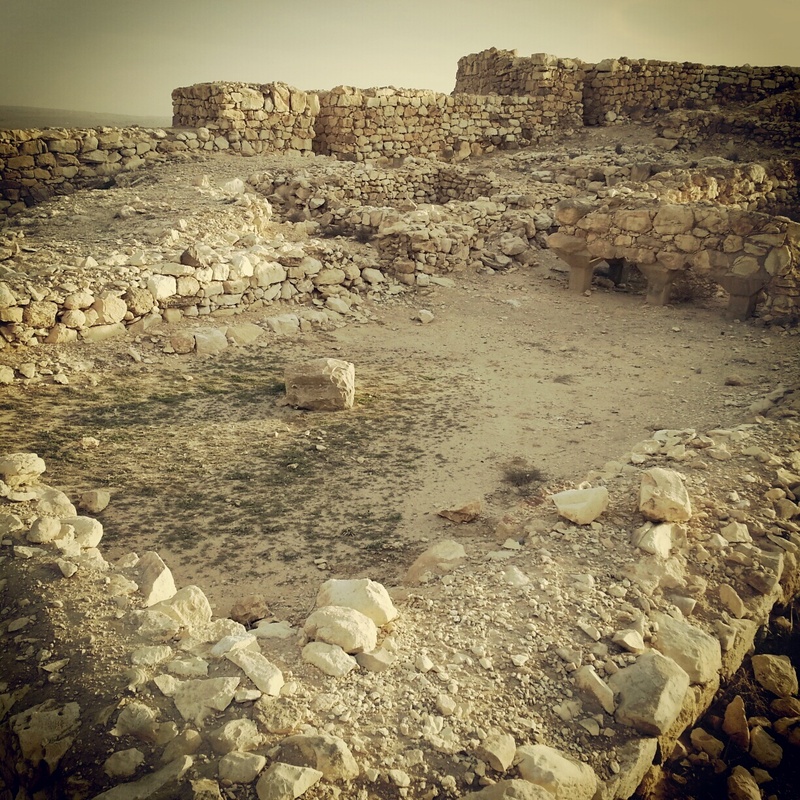 Tel Chanaton was a dwelling place of man from the Bronze age up until the end of the Persian rule in Israel, roughly a period of 3000 years, and then intermittently afterwards. It is mentioned in ancient sources including letters between Canaanite kings and indeed the bible. 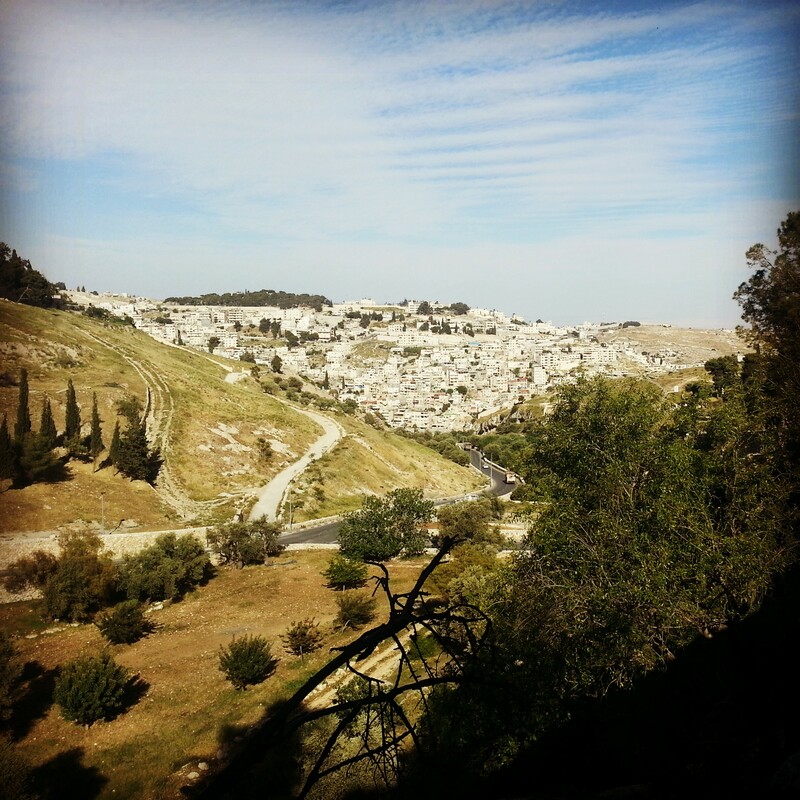 From our lookout on the tel we learned about the topography and geology of the Galil in addition to the importance of its situation close to several ancient trade routes. It was a place for people to stop off while travelling and restock food and water. In later times it was also used to collect taxes from travellers. 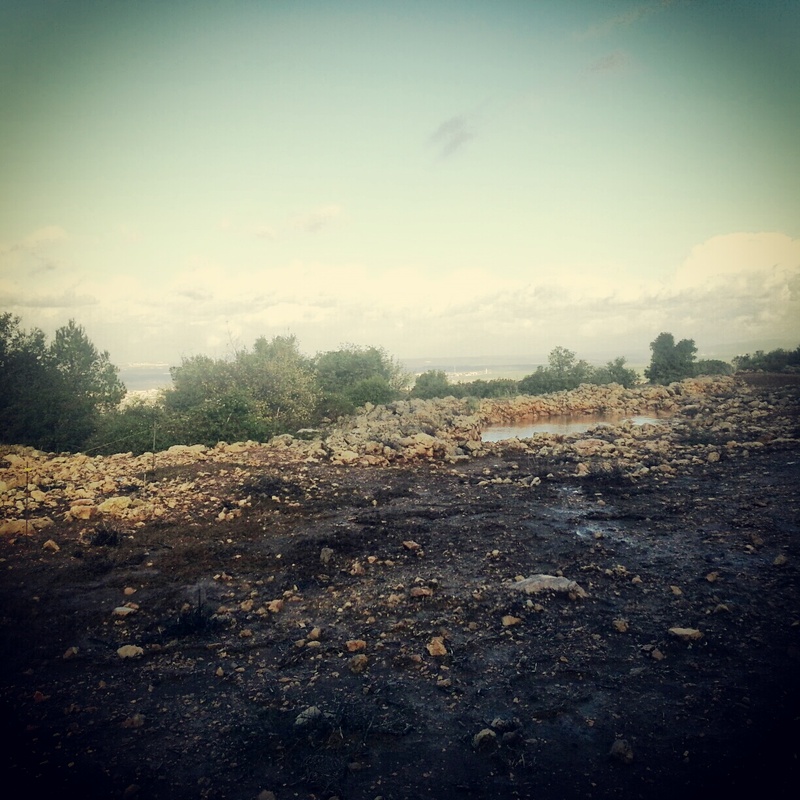 Israel is full of these mounds and many have been extensively excavated, but Tel Chanaton has not yet. 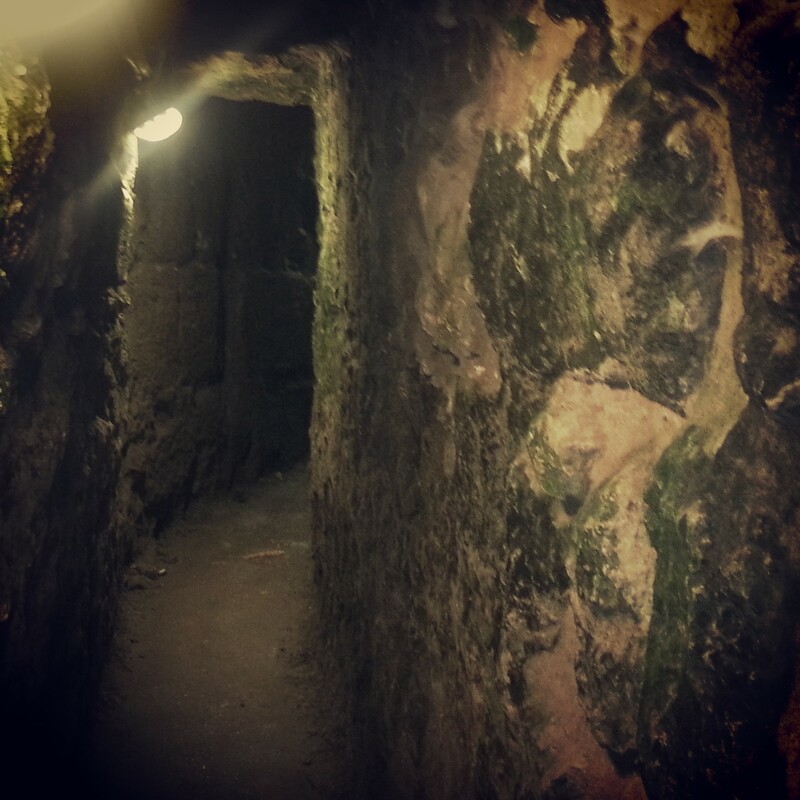 Some excavation has taken place though and you can squeeze into a small tunnel that takes you into the remains of a Crusader fortress that was based here. 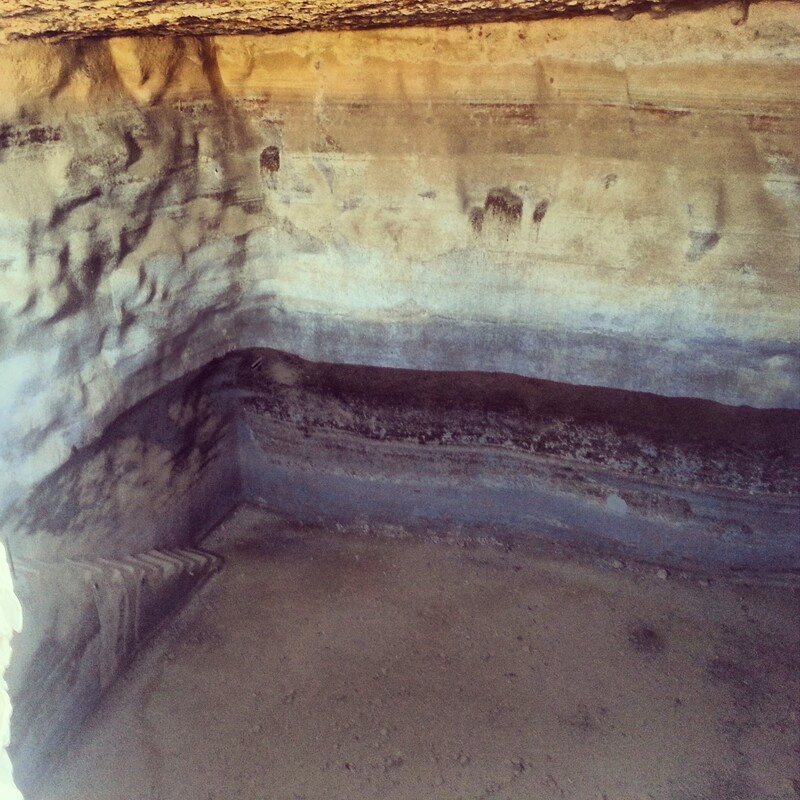 There is something quite remarkable about being inside it, knowing that it was not originally buried in the earth. It helps understand the other mounds you see, knowing that all the remains were originally like this. 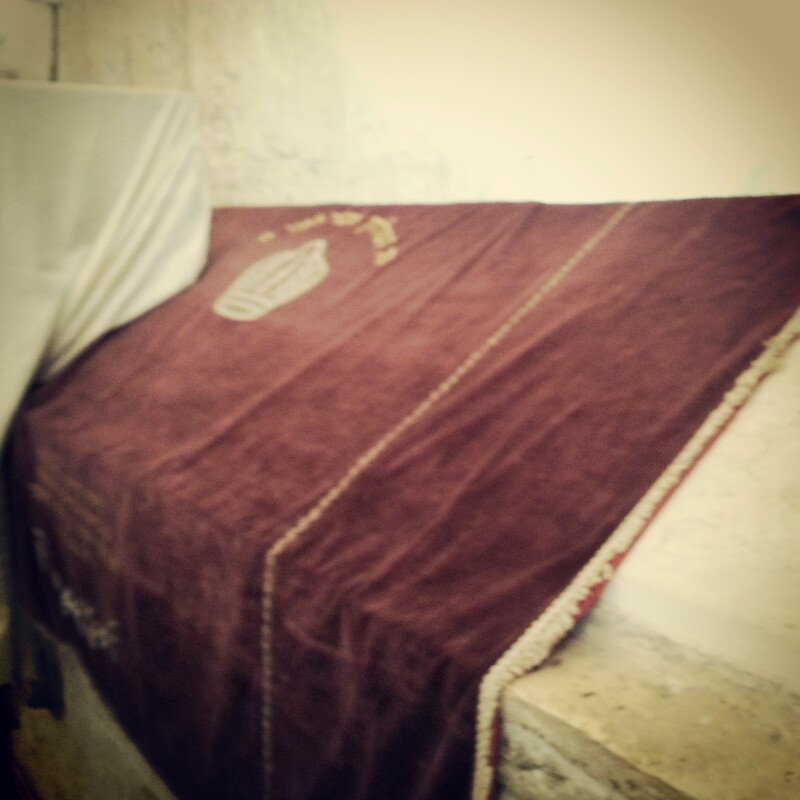 We moved on from the tel to the Muslim Arab village of Kaukab Abu al Hija. This village is named after the great Husam ad-Din Abu al-Hija, a lieutenant of Saladin. He was known as a righteous man, a man of the people, who encouraged good relationships between Jews and Muslims. We heard a couple of the legends of his time in charge of the area. In more modern times, this village stood out in the area by embracing the arrival of new Jewish villages. While other Arab villages protested, the mayor of Kaukab Abu al Hija argued in favour of the new arrivals saying that they brought with them better infrastructure and services to the area. He participated in cultural festivals that they organised and tried to develop his village for tourism. To this end, it was the first Arab village in Israel to have a ‘tzimmer’ (a sort of boutique BnB retreat) and they also developed a sculpture garden in the 1990s using work from Jewish and Arab artists in Israel. There were many interesting sculptures in the garden, many connected with thoughts and hopes of peace. 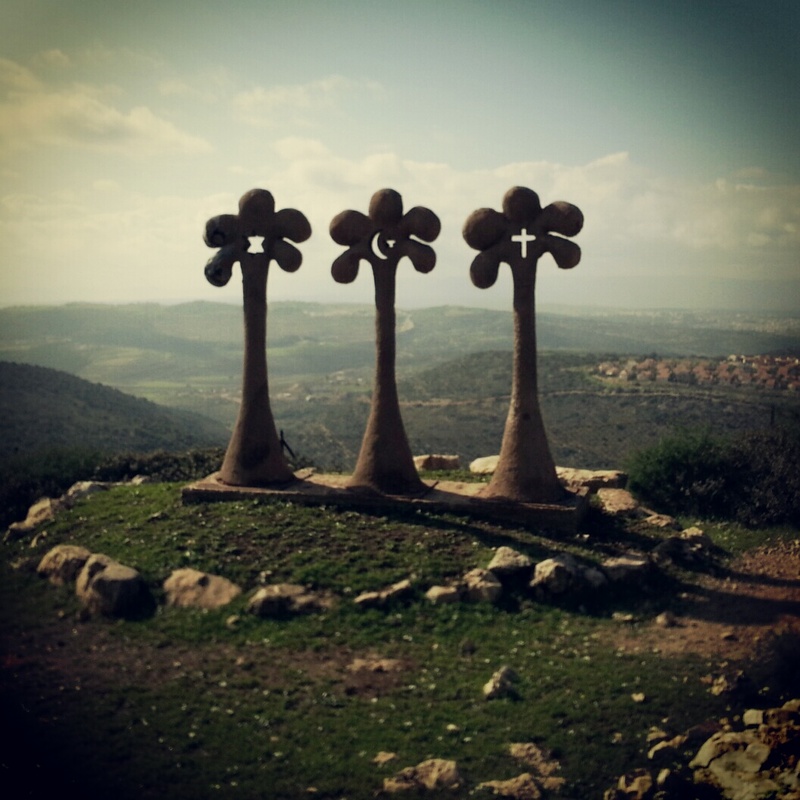 I found particularly striking the sculpture pictured of flowers of the symbols of the three major faiths against a stunning backdrop. Sadly our guide told us the flower with the Star of David was frequently broken (you could see where it had been restored); and the flower with the cross was torn down after the Pope made a speech a couple of years ago which was understood to have slandered Mohammed. Although this is sad, the encouraging thing is that the village council has consistently restored the sculpture. And hopefully it will endure. We moved on to a viewpoint over a small hill (not a tel, we were told) which used to house the ancient city of Yodfat, where we heard the story of its demise. When the Jews rebelled against the Romans in 66 AD, the military commander Vespasian was dispatched with his son Titus (of the arch’s fame) to subdue them. He set out into the Galil to destroy Yodfat which was a key centre for the rebels, under the command of man called Yosef ben Mattityahu. The Romans broke the city walls after 47 days; most of the town had committed mass suicide but Yosef ben Mattityahu survived. He returned to Rome with Vespasian and latinised his name, taking on the surname of his new mentor. The new Josephus Flavius became the official historian for the Roman empire in this region and his accounts are vital for us today in understanding what took place here under the Romans and indeed in locating important archaeological sites. Our next stop was at the communal village of Hararit, where the inhabitants are followers of Transcendental Meditation and meditate together as a community. We passed through the village though to the fields behind it and to the Lavra Netofa. We heard the story of two Christian monks who came here to live an acetic lifestyle in isolation, with a few followers. They found a Byzantine period cistern which they converted into a small chapel which was beautifully decorated for Christmas. It was incredibly peaceful and calm, and an appropriate setting for the story of the monks. The last of them passed away in 2005 but the chapel and community is now maintained by a group of nuns who moved here on their request for this purpose. We left Hararit and travelled a short distance to the communal village of Avtaliyon. Here we heard the story of the programme to encourage more Jews to move to the area of the Lower Galil in the 1970s and 1980s. At the time, the traditional founders of new communities, the kibbutz, moshav and youth movements, were waning in their strength and influence. So a new concept, that of the communal village, was created. The idea was that people would form a group based on shared interests; perhaps it would be Transcendental Meditation, as in Hararit. There were other new communities created by graduates of the Technion, or employees of Rafael. These communities have remained small but now exist in the Galil and all over the country. Our guide argued that they had helped transform the Galil into an area not known for a good standard of living to an area with a good lifestyle, good education and good employment. 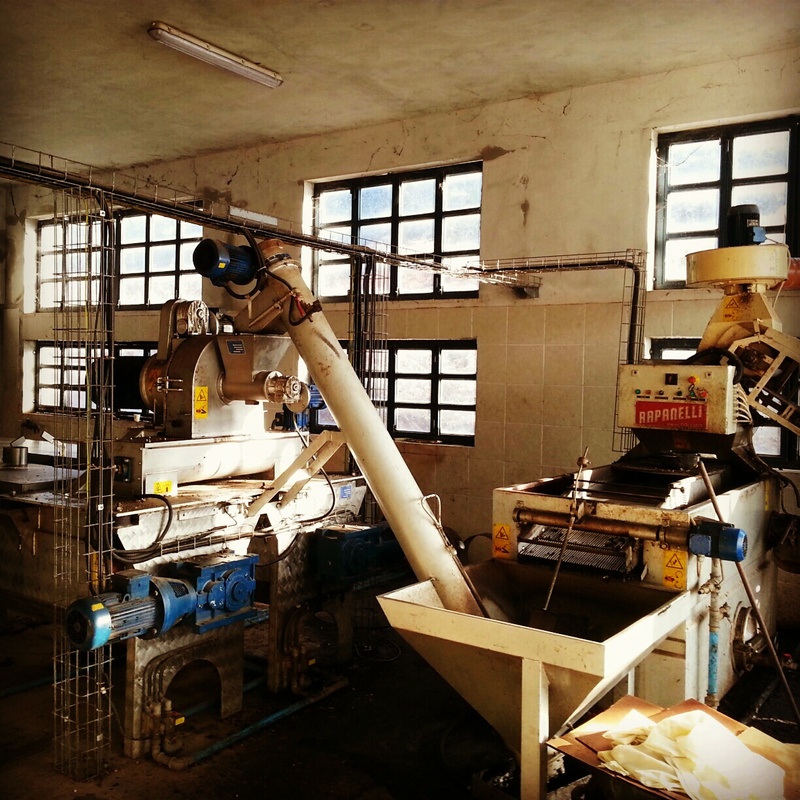 Here, we also learned about the manufacture of olive oil. 90% of olive oil in Israel comes from the Lower Galil. It is all made in the Arab villages except for in Avtaliyon, were they have their own press. Sadly, there was no time for tastings; a return visit is probably warranted. Our final destination was the Muslim Arab village of Deir Hanna. The Arabic name translates as Monastery of John the Baptist, as a tradition says that he was born there. It is a large Muslim village with the ruins of an 18th century fortress at its centre. 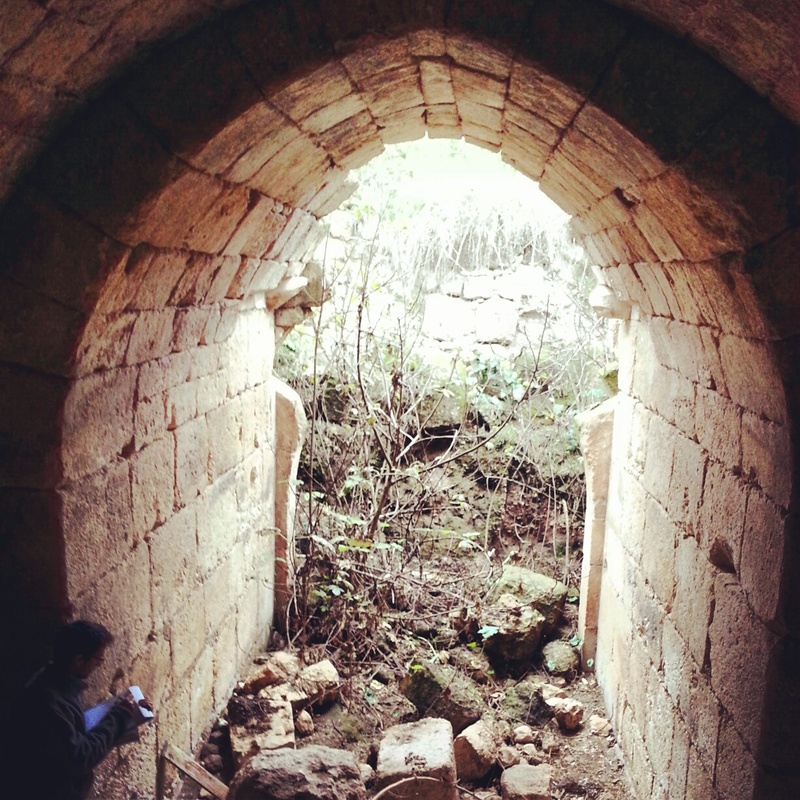 The visited the fortress and heard the story of its ruler, a local Sheikh called Daher el Omar who stood up against the Ottoman rulers, making himself an intermediary in their tax collection, and while doing so transformed the Galil region. There was barely a place around here that he did not influence, for example he built the city walls in Tiberias, in Akko, and even took a small village called Haifa, fortified and enlarged it. Sadly for Daher el Omar, the Ottomans had enough of him after around 50 years and having grown in strength they sent a military force to wipe him out. No one replaced him and the Ottomans remained in full control until WWI. 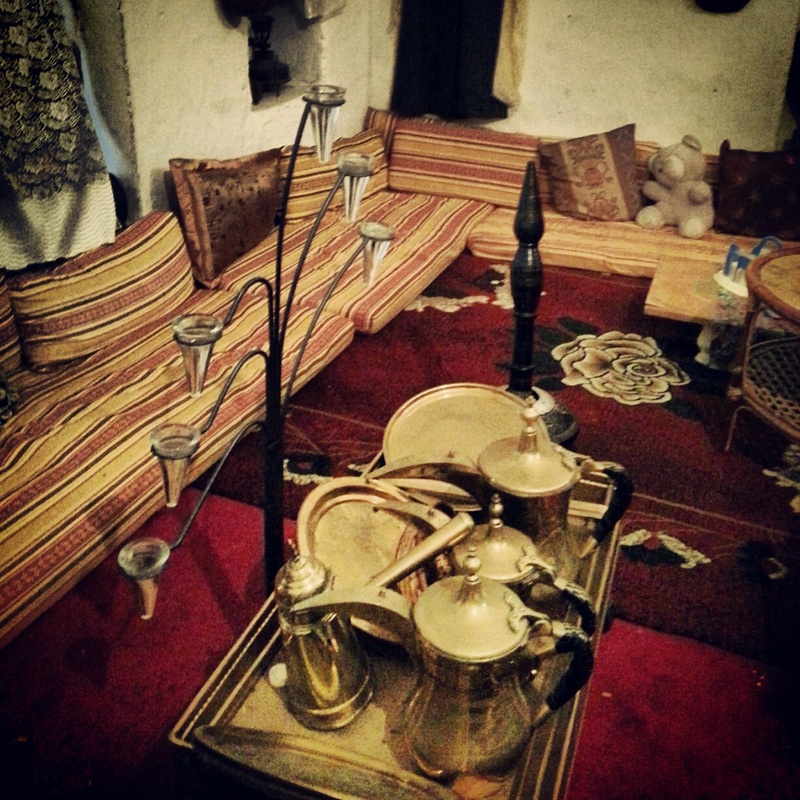 While in the village we visited a local home where the family hosts tourists and explains to them about traditional Arab culture, accompanied by traditional Arab cuisine (not to be sniffed at!). We learned about the traditional way of living and enjoyed some homemade olives (our course fees did not stretch to baklava and coffee, sadly). As the sun set, the call to prayer sounded around the village, and it was time for us to head home. And so it begins. After some logistics and forms the night before, we gather as the sun rises over Tel Aviv at Arlozorov bus station, ready to set out on our first trip on the guiding course. The previous night, our rakaz (coordinator) had instilled the fear of God into everyone, promising that the bus was leaving at 6.30am and if you were not on it, then tough. And then he said it again, several times. Obviously, the last thing you want to happen having already woken up at the crack of dawn is to make it all worthless by missing the bus, so it was that when I showed up half an hour early there were already about half the course there to meet me. And yes, we did leave on time. Our first journey took us south into the North of the Judean desert. But before we could get to our first site of the day, we had about 90 minutes of travel time. I pulled out my travel pillow, looking forward to catching up on those lost hours of sleep. This went well for about 5 minutes before our guide grabbed the microphone and started pointing things out as we travelled down the road, and of course we were writing this all down. One of the things that I love about this country is the incredible concentration of sites of interest. I must say, however, that this can be a mixed blessing; when on the guiding course one receives far more content than one would on a normal tour, to equip us for every situation and eventuality, so significant concentration is required. 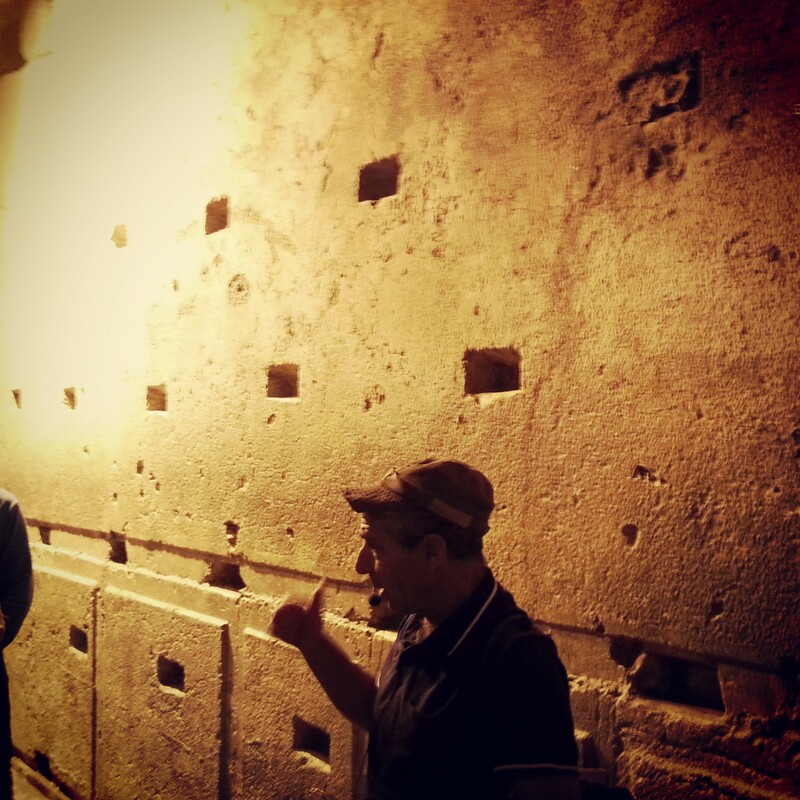 “On the left, an ancient archaeological site; on the right, the site of Israel’s first soap factory; look at the rock here which is a reddish colour because of the copper, etc”. And I dutifully listened, and looked, and noted, and worked out some of the more complicated Hebrew words (limestone, flint, aqueduct, weaving ant, to name but a few of the additions to my lexicon on this trip). We passed Jerusalem and began the descent into the Judean desert. I love the desert. Israel has two: the Judean Desert, and South of it the Negev. Both are rocky (there is a small area with some dunes). The craggy rocks, the undulating hills (Israelis call them mountains, but having spent two and half years in Switzerland, I’m not sure), the weaving valleys, I find it all so incredibly beautiful. And tranquil. An amazing tranquillity in the desert. A place to enjoy the aesthetics, to think and absorb the beauty of nature. And lots of historical, geographical and geological information too, on this occasion. There are of course many sites of interest, and our first stop was at the Inn of the Good Samaritan. 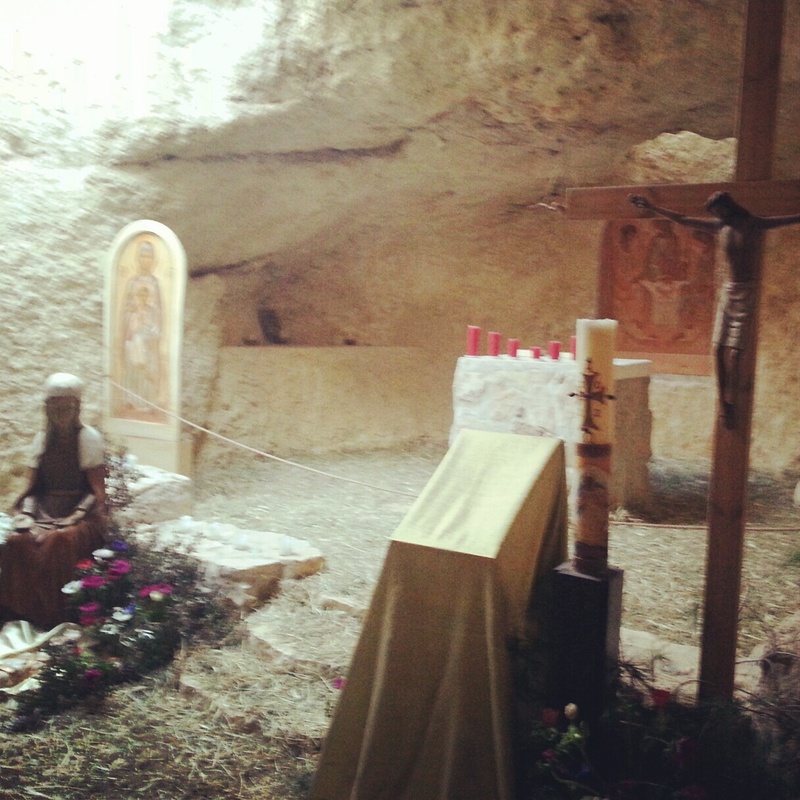 According to tradition, this is the site of the famous Good Samaritan parable told in Luke’s gospel. 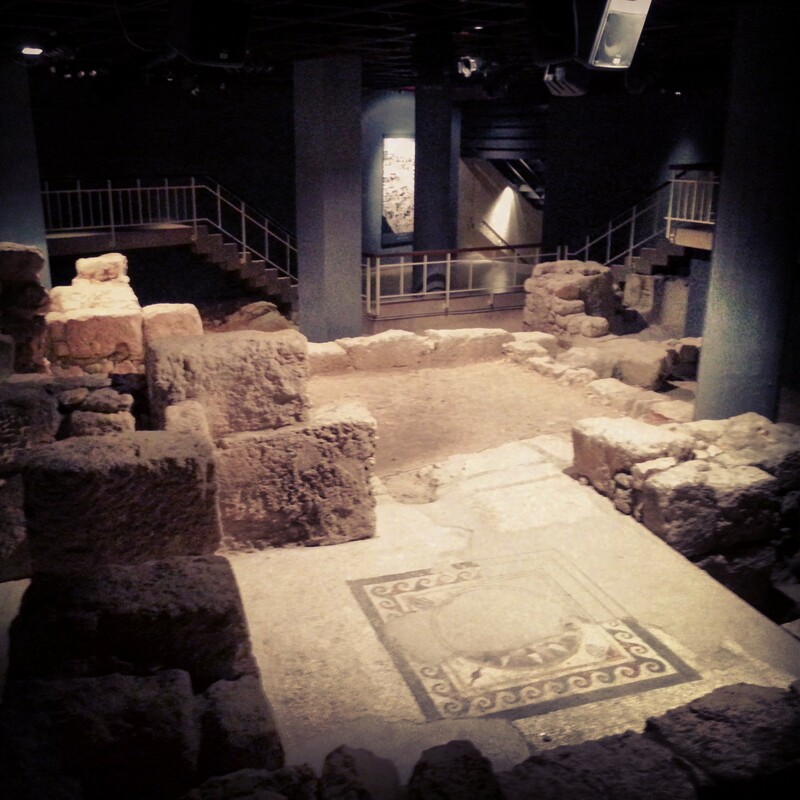 In the 6th century a church was built here, and you can visit the partial reconstruction. 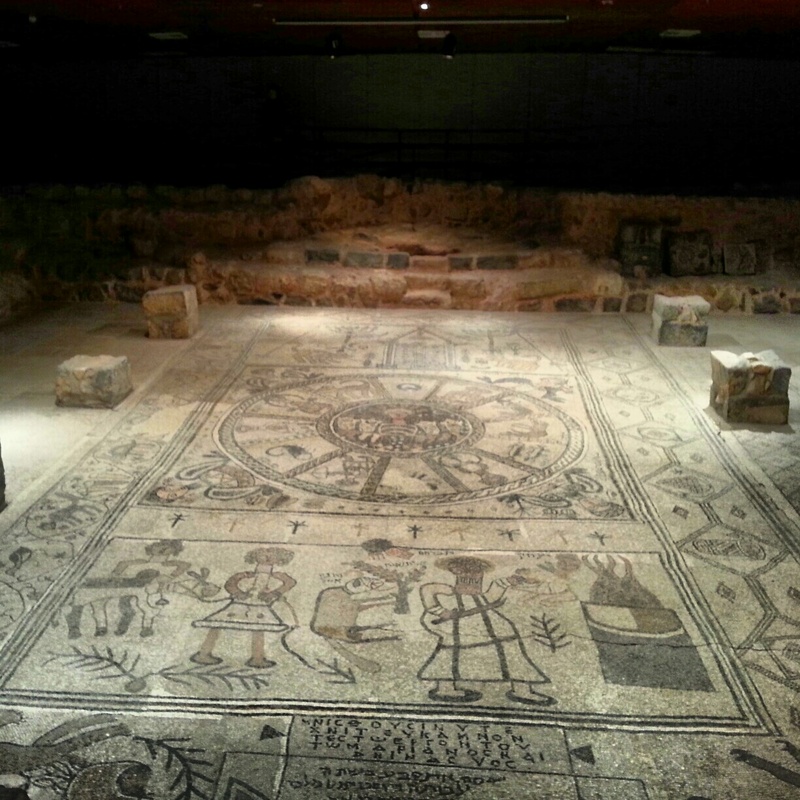 There are also a variety of artefacts and stunning mosaics (like the one above) from around the area (partly in an air-conditioned museum). The museum also contains a very interesting display on the Samaritans (the original sort, not the British charity), who still exist in Israel although latest numbers put them at under 1000. We will learn more about them as the course progresses. Back on the bus and a short hop down route 1 to this stunning viewpoint over Wadi Kelt. The view was so breathtaking that it required a moment’s reflection before turning to the important matter at hand of identifying the sites of interest; I can now point out a variety of locations from the viewpoint; from Jerusalem to Jericho; from a palace of Herod to the birthplace of Robert Kennedy’s assassin. Just in case you were wondering, of course. As we continued on towards the Dead Sea we had a short nature break; I was thrilled to bump into an old friend and very experienced guide who had been advising me about the career transition, Mike Hollander. It was something of a heart-warming moment and seemed to me to be a good omen. The next step, via Lido junction (the lowest point on land in the world), was the site of the Ashlag factories, the first factories at the Dead Sea, used to mine potassium. The story of the Russian tourist who happened upon this area, had the idea to start mining, and nagged the British authorities for nine years to let him do so, was quite remarkable. But it was also sad to realise that the Dead Sea waters used to come up to this spot, but are now several kilometres away. More on that later. 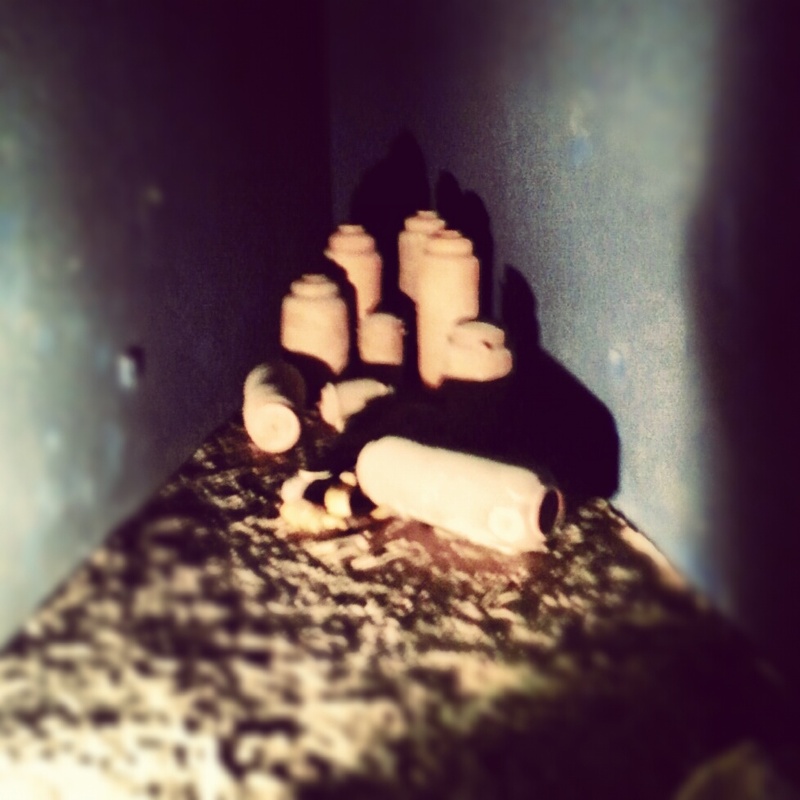 This site fell into Jordanian hands in 1948, and was then taken by Israel in 1967, at which point it became an army base. 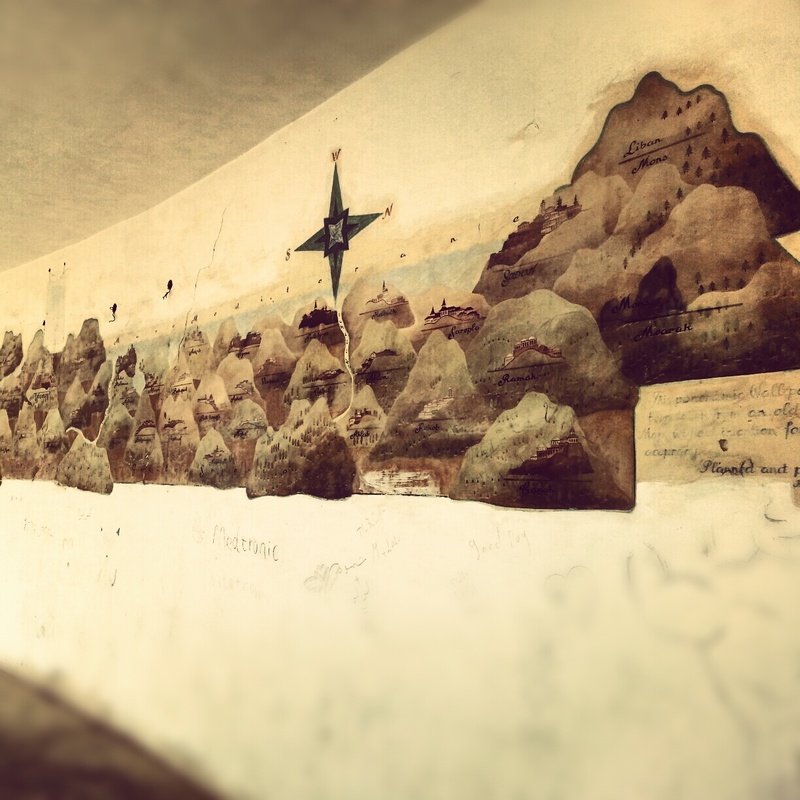 An evidently very bored officer on reserve duty took a crusader map of the Jordan valley and painted it on the walls (cheekily adding in the local Lido junction). It is actually pretty impressive, an extract is pictured below. Onwards South we went with the next stop being Einot Tzukim, the ‘lowest nature reserve in the world’. I’m not sure that is particularly anything to shout about on its own, but that should not let anything be taken away from the nature reserve. 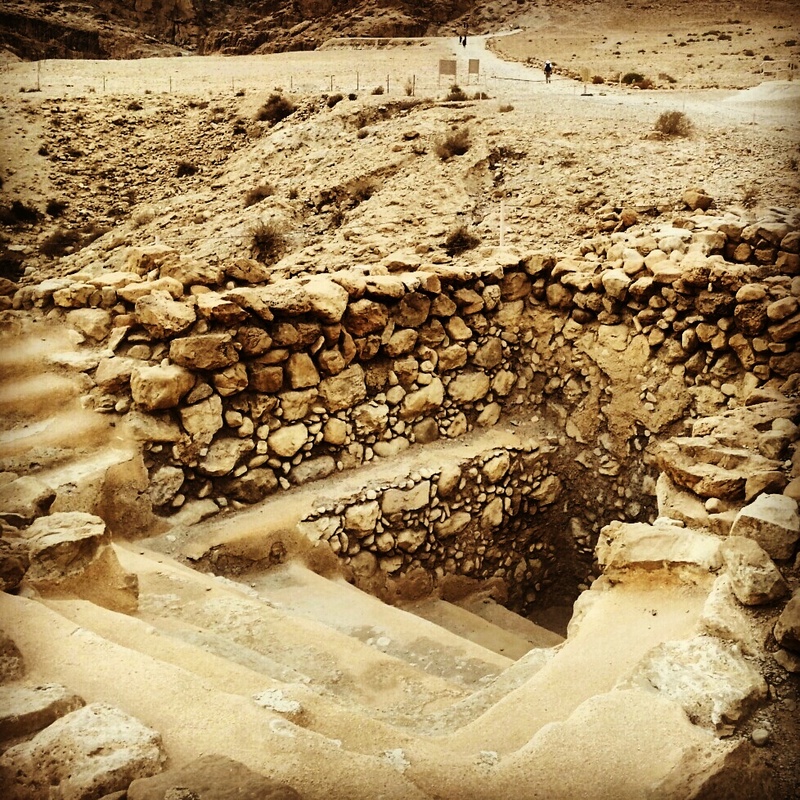 Based around 130-170 fresh water springs in the middle of the desert, King Abdullah of Jordan was so taken with the area that he designated it for his use only, when it was Jordanian territory. When it was no longer Jordan, Israel made it a nature reserve, and it was remarkable to see the freshwater springs and also to learn about the extensive wildlife, set right in the middle of such an incredibly barren and unwelcoming landscape. The reserve also encompasses an archaeological site; the theory is that it was used to make the mythical afarsimon oil, known to have been an extremely valuable commodity in ancient times. No one knows what afarsimon was for sure (the word exists in modern Hebrew and means persimmon, but it is not the same fruit) but the search continues. There is also some modern history – the day of declaring the state Ben Gurion came here with his wife for a bit of ‘me time’ before heading up to Tel Aviv to make history. No doubt he was enjoying the serenity of the desert before what he knew would be complete chaos. And so the ancient and modern worlds connect. Slightly further South we braved the oncoming traffic to cross over route 90 (the longest road in Israel) and visit the Ruins of Mazin. This consists of the remains of what was an ancient ship yard on the Dead Sea, with evidence that it was an economic resource even in ancient times – a stash of coins nearby probably used to pay for asphalt brought up by the ships. We then began the journey in the direction of home, slowing to take in the rather depressing Palestine Exploration Fund (P.E.F.) Rock. The P.E.F. was founded in 1865 and still exists, with the purpose of exploring, mapping and excavating the land of Israel, which was at the time under Ottoman control (they may have been gathering intelligence on the side, cheeky things). 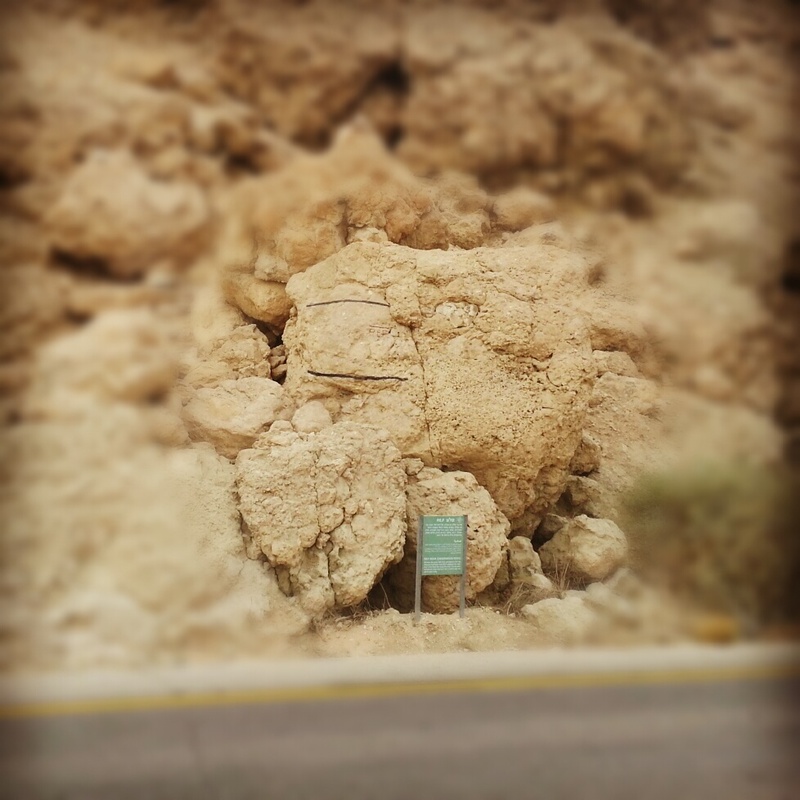 The rock marked the height of the Dead Sea at the beginning of the 20th Century. 100 years later and it’s quite sad to think that it is now some distance away from even touching the rock. It’s caused largely by a huge increase in the use of the tributary, the Jordan River, for water by all its surrounding countries. Hopefully the scientists and politicians can find a way to fix it. Our penultimate stop was at Qumran. 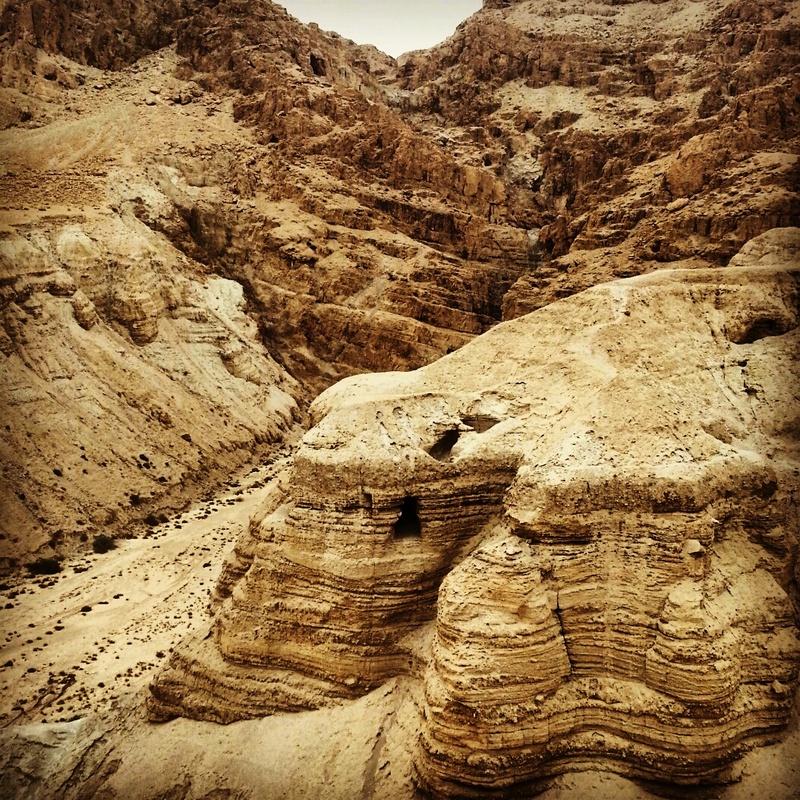 I remember stopping at Qumran once before; a family road trip to Eilat. Dad saw the sign and decided that he wanted to stop there; I think everyone else wanted to get home (it’s quite a long drive). I vaguely remember it being closed in any event. This time, I certainly appreciated it more. Qumran is the site around which many of the famous Dead Sea Scrolls were found; their discovery is quite an incredible story. Some of these scrolls date back to the 2nd Century BCE, and are the oldest copies of the books of the bible in existence. I studied them a bit at university, and this context always adds more to visiting a historical site. It is thought that here lived a group of Essenes, a sort of ascetic cult that broke away from the mainstream Judaism in the Second Temple Period. There is a good explanatory film and small museum and then you can walk around the site. I always find it amazing to wonder around these ancient places, to imagine people walking those same paths thousands of years ago. It must have been tough in Qumran, in the middle of the desert, an unforgiving place where it sometimes rained once in two years. They must have been pretty committed. Eventually we were thrown out at closing time. 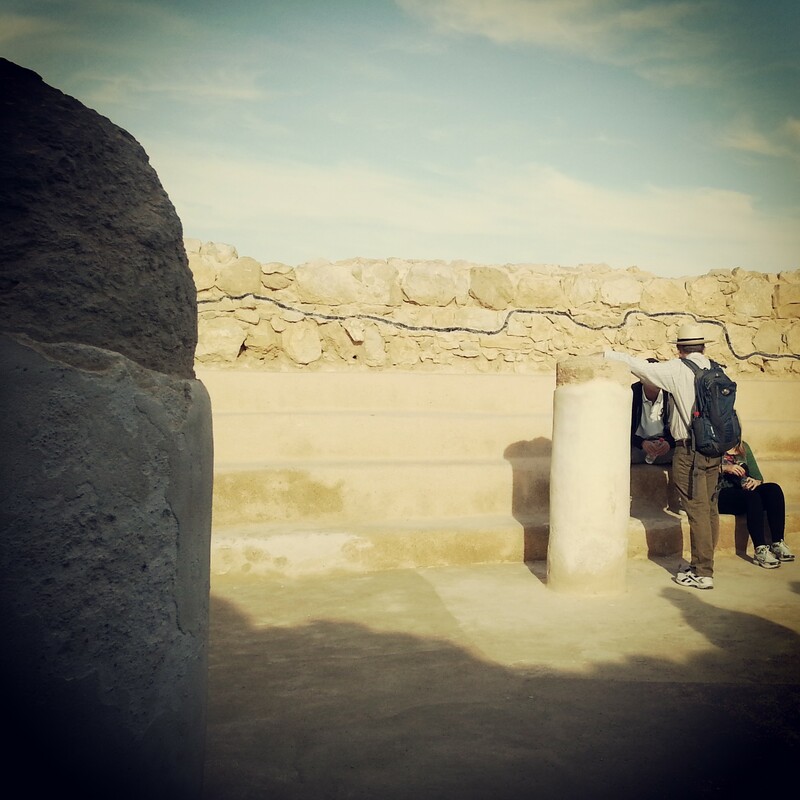 There was time for just one more brief stop on the way home, Nabi Musa, the site where Muslims believe Moses is buried. Night was falling and prayers were beginning so we didn’t stay long; a quick peek at the shrine and some history outside before heading home, arriving at Arlozorov at 6.45, just over 12 hours after we had left. Quite an intense first day! In addition to all the general information, we also received lots of useful practical tips, such as good places to stand and address a group in a particular site; good routes; ideas about how to integrate sources. One has to pay just as much attention to the way the material is delivered, as to its content. At every site I was thinking about how I would relate it when my time to guide will come; plenty of food for thought. All in all, very enjoyable, although completely exhausting. Looking forward to more to come!